In an age where the large, world-straddling internet giants appear to offer every service under the sun, it’s refreshing to get to know a vendor whose focus is centered entirely the experience, development and performance of business’s most precious resource– its people. Rather than attempt to cover off every single human resources function (like payroll and HRIS for example) Saba Software focuses on empowering organizations to develop their workforce’s skills and those of the people who manage them, in HR departments of any size or scope. Ensuring that employees are engaged and productive in the workplace depends on a high degree of personalization. 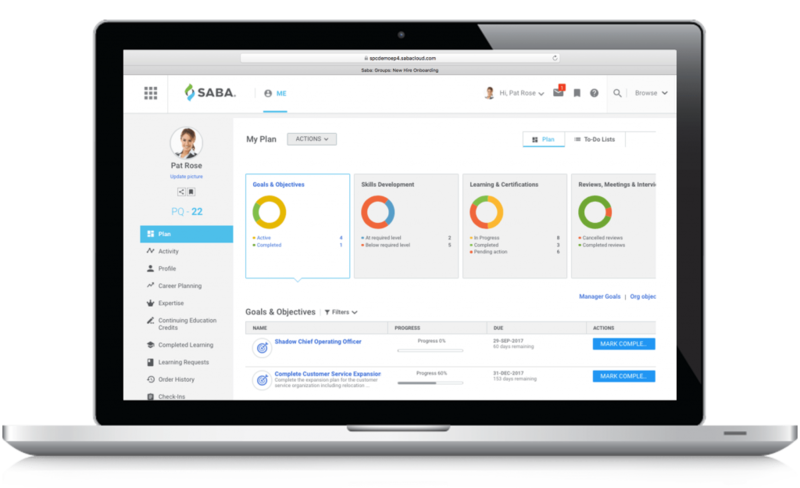 Saba’s solutions help employees own their own development, performance and growth through self-driven learning experiences, digital collaboration, coaching, feedback and recognition tools, while staying aligned and connected to the goals of the organization. As individual as the people that work in them, every company has a different approach to people development. Saba Learning solutions allow you to engage modern learning with interactive video, best-in-class content, personalized employee-discovered learning as well as the ability to curate micro-learning alongside traditional instructor-led, or online e-learning programs. Collaboration, communication and alignment between managers and employees are crucial elements to a high performance culture. Saba Performance solutions enable companies to cultivate and develop core competencies, engage with ongoing coaching and feedback and check-ins, as well as point-in-time assessments to help people achieve their performance goals. Saba knows that getting the very best from your employees not only helps them develop as human beings and boosts employee engagement, but also increases individual and organizational performance. Saba’s people-centricity starts with the nature of the platform itself. Since the consumerization of technology, there’s an expectation that even the most complex workplace task can be undertaken on a smartphone or tablet. Saba’s hyper-connected talent environment is designed to make learning and development, recognition, coaching and feedback a part of your people’s every day experience, so they can deliver their best – anytime, anywhere. The Saba mobile app does just that, integrating seamlessly with the range of tools deployed in the modern workplace. The solution offers the ability to align employee goals with your business strategy to ensure everyone is working to achieve your key organizational outcomes. You can also build engagement through tools and features that reinforce a culture of ongoing employee feedback, coaching, and recognition. 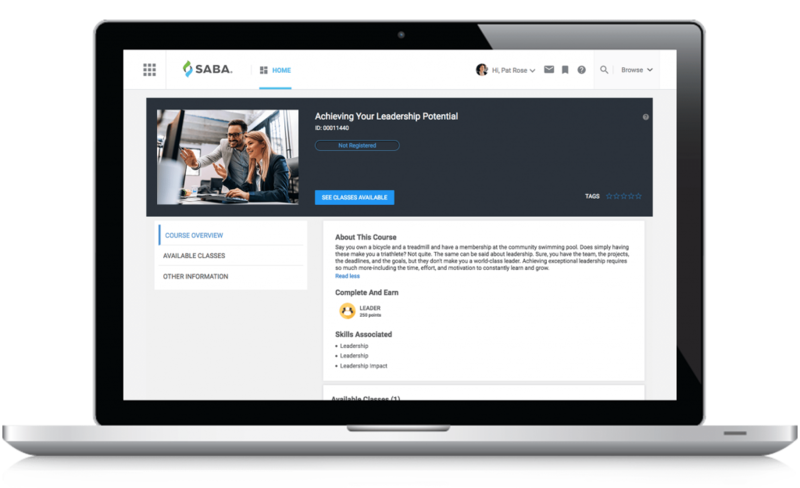 In an age of personalization, also fueled by the same consumer-led trends, the Saba learning platform provides personalized, specialized training and career development frameworks for each employee. To truly measure the impact of your talent programs on employee engagement and business outcomes, you need to collect employee feedback. Saba Pulse enables organizations to get employee feedback, providing the real-time insights needed to connect your talent programs to business outcomes. Saba has received ongoing recognition globally for product innovation, market leadership, and most recently for its customer focus – winning the coveted “Customers’ Choice” ranking for Talent Management from Gartner Peer Insights. To find out more about how Saba’s solutions can help your organization on its talent development journey, get in touch with a local representative (there’s a free product tour you can take).